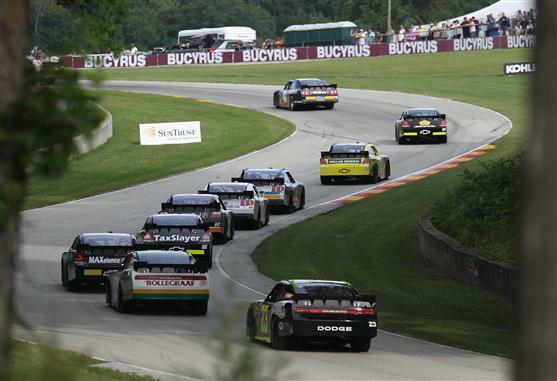 The first excursion for the NASCAR Nationwide series on the road courses for 2011, the Road America round was a complete change in tone for a stock car tour dominated by oval tracks. A 4.048-mile track in Elkhart Lake, the Bucyrus 200 race is 50 laps of unique fender-to-fender competition. Spending much of this 2011 season as a driver for a "Start and Park" effort in the NASCAR Sprint Cup series, Michael McDowell was given a golden opportunity to compete for a NASCAR trophy with Joe Gibbs Racing's Nationwide series team. Driving the #18 Toyota, McDowell was fast throughout Friday practice as the young driver polished up on skills acquired through his road racing background. Against the likes of Jacques Villeneuve, Ron Fellows and Max Papis, Michael McDowell accomplished early greatness by taking the Joe Gibbs Racing Toyota to the top in qualifying. Max Papis, Jacques Villeneuve, Billy Johnson and Ron Fellows rounded out the top-5 in a qualifying session occurring just ahead of the actual race. In the late Saturday afternoon event, the NASCAR Nationwide Series Bucyrus 200 received the green flag with 42 drivers immediately demonstrating their varying levels of road racing experience. Led by McDowell, the past champion of the Star Mazda tour showed staying power at the front. The #18 Toyota Camry led the race's first 6 laps on his way to leading 30 overall laps in the event Saturday. Other vehicles and drivers who would claim an early lap includes the #66 Toyota of Steve Wallace as well as the the #22 Discount Tire Dodge Challenger driven by Jacques Villeneuve. Both Villeneuve and Wallace spent 4 laps out front at Road America. Deeper in the field, NASCAR Nationwide Series points leader Ricky Stenhouse Jr was encountering a much more difficult compared to the front contenders. Spinning in turn three on only the third lap of the Bucyrus 200, Stenhouse Jr's #6 Ford narrowly averted serious collisions with the #32 Chevrolet of Reed Sorenson and the JR Fitzpatrick's Go Canada Racing #67 Ford Mustang. A rough start for the young Roush Fenway Racing development driver, Rick Stenhouse Jr would receive a lesson in perseverance as the #6 Ford would claim a top-10 finish. As the race endured, the road race ringers began to assert themselves against the Nationwide series regulars. Jacques Villeneuve was a frequent figure in the top-10 as was the #33 Chevrolet of Max Papis and the #7 JR Motorsports Chevrolet piloted by last year's runner-up at Road America Ron Fellows. Through the latter laps of the Bucyrus 200, Papis and Villeneuve delighted the fans with a fierce battle for what would eventually amount to top-5 positions. In the last 10 scheduled laps of the Bucyrus 200, the #11 car of Brian Scott played a tight fuel economy gamble only to be quickly overhauled by the leaders. Led by Michael McDowell in the late going, the #18 Toyota driver stormed past Scott for the lead position with the #7 car of Fellows accompanying McDowell. 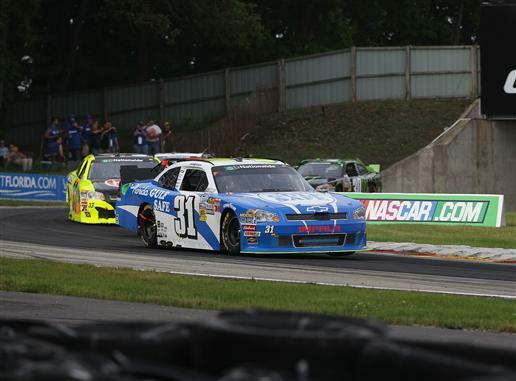 In the lead and pulling away from Ron Fellows, McDowell appeared to be on track to certain victory at Road America until caution flew. The full-course yellow flag was shown on lap 48 after the #41 car of Doug Harrington spun and stopped in the track's 11th turn. Erasing the #18 Toyota's over 6 second lead, the late caution set up what would be a wild green-white-checker battle that burned through NASCAR's maximum three attempts. Positioning a drivers in a situation to easily steal positions, the first green-white-checker on lap 50 gave a textbook example of ultimate aggression heading into a two-lap sprint. Taking the green, Jacques Villeneuve brought his Penske Racing #22 Dodge Challenger into a precarious three-wide into turn 1. Brushing the in-field grass, Villeneuve launched back into the race track pounding into the #11 Toyota of Brian Scott. Sending Scott spinning into the corner's sand trap, the #22 Dodge also clipped the #33 Chevrolet of Max Papis. Becoming a passenger as the #33 Kevin Harvick Incorporated Chevrolet slides, Papis made hard head-on contact with the track's retaining wall. Out of the three cars involved in the incident, Jacques Villeneuve's #22 Dodge would actually end up in the best position at the end of the Bucyrus 200 finishing in 3rd place. However, an angry Scott and an irate Papis would quickly seek out Villeneuve in post-race first explaining their displeasure through gentle but telling bumper tag. Bunching the field together, the late race caution gave a chance for the Turner Motosports #31 Chevrolet of Justin Allgaier to contend for the win. In the second restart to the checkered flag, Allgaier would effectively muscled his way to past Ron Fellows as the Nationwide regular set sights on McDowell. As Allgaier chased down the #18 Toyota, leader Michael McDowell spun out hading the lead to the #31 Chevy. Taking the top spot at Road America, Allgaier's desire to run to victory lane was defeated by several NASCAR Nationwide cars coming together in turn 6. An incident resulting from McDowell's spin, Steve Wallace, Alex Kennedy, Ricky Carmichael and Eric McClure were caught up. Justin Allgaier led the double-file field to green for the third green-white-checker restart with Ron Fellows starting alongside. By the time cars passed the start-finish line, Allgaier's Turner Motorsports teammate Reed Sorenson in the #32 Dollar General Chevrolet stormed past Fellows for the second place. just as the #31 stock car of Justin Allgaier was pulling away from his competition, the #88 Chevrolet of Aric Almirola became stuck in a off-track safety trap. As Almirola's stricken car brings full course caution for the third and final time, the Bucyrus 200 would be settled with Justin Allgaier as a winner. However, in a plot development fitting for all the wild action on track, Allgaier's #31 car began to lose power on the final lap. In the NASCAR rulebook, a leader must maintain a reasonable pace in order to stay in position. Ultimately losing the race on fuel, Allgaier lost due to less than a gallon of racing fuel. With the #31 Chevrolet coasting ever so slowly, the second place car inherited the race lead as well as the prized victory of the Bucyrus 200 at Road America. Though the #7 Chevrolet of Ron Fellows appeared out front of the competition, NASCAR deemed his pass to occur under caution. In second place prior to the caution, Allgaier's Turner Motorsports teammate Reed Sorenson took the win of the Bucyrus 200. Sorenson's first NASCAR Nationwide Series win since Gateway in 2007, the #32 Chevrolet ducked the early race mishap with Ricky Stenhouse Jr's #6 Ford. After getting roughed-up by other drivers through the final laps, Canadian Ron Fellows road racing skill kept him in the runner-up position (the second year in a row at Road America). Behind 4th place Jacques Villeneuve, Elliott Sadler driving the #2 Chevrolet collected an important 4th place finish. With the race result, Sadler is still 2nd in the NASCAR Nationwide series drivers standing but only 5 points ahead of Sorenson. Mike Wallace's #01 Chevrolet rounded out the top-5 of the Bucyrus 200 with Andrew Ranger, Michael Annett, Ricky Stenhouse Jr, Ricky Carmichael and JR Fitzpatrick composing the top-10 in the first NASCAR Nationwide Series road course event. Though Canadian drivers did not capture victory after a strong showing at Road America, the North American country can celebrate a very impressive feat. Fellows, Villeneuve, Ranger and Fitzpatrick together provided a rare opportunity to have 4 Canadian racers finish in the top-10 for a major NASCAR touring series event (may be a record but I can not confirm). NASCAR Nationwide Series cars return to oval racing on Friday night at Daytona International Speedway.